Targeting Women Buyers | Sub Prime Auto Leads - Car Sales Leads - Special Finance Car Loan Leads by CyberLead, Inc.
Women buy 45% of the vehicles that are sold today. This means that the average car dealership sells about 820 cars per year to women. Yet many business owners and dealerships still don’t directly acknowledge or target this market for advertising to sell directly to women. If dealers want to stay competitive today, they have to tap in to the other (almost) half of the population that is buying cars. 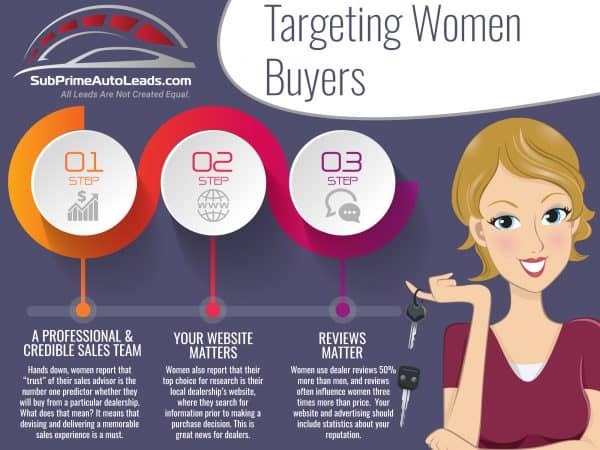 Before you start a marketing campaign that is focused on women however, you need to understand what women are looking for not only in vehicles, but in dealerships. According to Women-Drivers.com, the number one reason that women choose a particular dealership over another to buy a car is trust. “Many dealers think the lowest price is the top reason. Research shows women seek a trusted advisor first to help them navigate the myriad of choices when selecting a vehicle. This means your dealership’s perceived level of trust by guests and buyers has a direct impact on your bottom line.” There is a direct parallel between increasing trust and increasing sales. Hands down, women report that “trust” of their sales advisor is the number one predictor whether they will buy from a particular dealership. What does that mean? It means that devising and delivering a memorable sales experience is a must. Women also report that their top choice for research is their local dealership’s website, where they search for information prior to making a purchase decision. This is great news for dealers. However, this can sometimes be where the dealership loses the sale. Women report that websites that are too product-driven are less appealing than ones that are lifestyle-based. A winning website illustrates how a particular vehicle or dealership will help meet a woman’s day-to-day needs, whether it involves transporting children, getting to work or other activities. Women use dealer reviews 50% more than men, and reviews often influence women three times more than price. Your website and advertising should include statistics about your reputation, positive reviews and any awards your dealership has received. Know your women customers. Encourage them to write reviews. Take the time to read your reviews and always thank, acknowledge, and respond to each one. Create a friendly, inviting digital presence and ensure that your website speaks directly to women customers. Treat potential women customers with respect and listen closely to ensure that their needs are met. Honor the knowledge and research information that they may already have about the vehicle you are discussing. While these techniques may sound quite simple, keep in mind that half of women car buyers report that they go to over three dealerships before making a purchase. The other half, however often purchase new vehicles on their first visit. These women reported that feeling respected, listened to and validated—helped them trust in the salesperson and the entire purchasing process. Increasing trust to increase sales is an interactive process that requires practice and commitment, something that is important to all buyers and the future success of your dealership.